BERWYN, Pa., Jun. 12 /CSRwire/ - Today, the nonprofit B Lab has recognized nearly 1,000 companies for creating extraordinary positive impact as businesses. The honoree selection is based on an independent, comprehensive assessment, the B Impact Assessment, which is administered by B Lab. Honorees are featured on B the Change, the digital Medium publication produced by B Lab, at bthechange.com/bestfortheworld. Honoree companies earn placement on one or more of six possible Best For The World lists, which include businesses that earned scores in the top 10 percent of more than 2,500 Certified B Corporations across all categories on the B Impact Assessment. 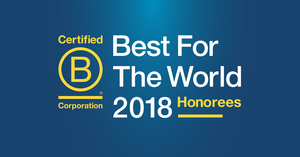 B Lab simultaneously released separate lists recognizing top-performing B Corporations as Best For The World: Overall, Best For The World: Environment, Best For The World: Customers, Best For The World: Governance, Best For The World: Community and Best For The World: Workers, all of which can be found at bthechange.com/bestfortheworld. This fall, B Lab will release further Best For The World lists honoring top-performing funds and companies making the most positive change over time. The full B Impact Assessment evaluates a company’s environmental performance, employee relationships, diversity, involvement in the local community, the impact a company’s product or service has on those it serves, and more. Honorees scoring in the top 10 percent of all B Corporations set a gold standard for companies using business as a force for good. To certify as B Corporations, companies must complete the full assessment and have their answers verified by B Lab. Today there are more than 2,500 Certified B Corporations across more than 150 industries and 50 countries, unified by one common goal: to redefine success in business. Any company can measure and manage social and environmental performance at http://bimpactassessment.net. B Lab is a nonprofit organization that serves a global movement of people using business as a force for good™. Its vision is that one day all companies compete not only to be the best in the world, but the Best For The World® and as a result society will enjoy a more shared and durable prosperity. B Lab drives this systemic change by: 1) Building a global community of Certified B Corporations who meet the highest standards of verified, overall social and environmental performance, public transparency, and legal accountability; 2) promoting innovative corporate structures like the benefit corporation to align the interests of business with those of society and to help high impact businesses be built to last; 3) helping tens of thousands of businesses, investors, and institutions measure what matters by using the B Impact Assessment and B Analytics to manage their impact with as much rigor as their profits. B the Change is a Medium publication produced by B Lab in collaboration with the community of Certified B Corps and the movement of people using business as a force for good.